Grand Incentives recently won the prestigious GOLD ADDY Award for its Coast to Coast Grand Getaways travel membership renewal kit. A GOLD ADDY is recognition by the American Advertising Federation (AAF) of the highest level of creative excellence. Posing with the ADDY honors! From left, Grace Martinez VP of Grand Incentives, Lisa Codianne Fowler Corporate Communications Director and Derek Overholt Art Director. 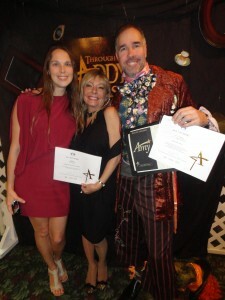 The “Through the ADDY Glass” Awards Gala was held on the bay front at Selby Botanical Gardens in Sarasota, Florida, where results of the AAF Suncoast ADDY competitions were announced. As a Gold ADDY winner, the piece is automatically entered in the District 4 competition. District winners are eligible for national awards. The AAF anticipates 40,000 entries on the national level. Ellen Trott, V.P. of Club Operations, oversaw the budget for the project. GI’s Senior Art Director Derek Overholt, designed the winning entry, and Corporate Communications Director, Lisa Codianne Fowler wrote the copy. Overholt won additional awards for a separate entry as well as first prize for his colorful, attention-grabbing Mad Hatter costume.